You’ve probably seen them everywhere – those little black and white square barcodes you can scan with your smart phone. QR codes, or Quick Response codes, are a growing trend, offering marketers yet another way to reach their audience. Below we take a look at QR codes and how your business can use them as part of your marketing strategy. Quick Response codes were originally invented in Japan for use in the industrial industry as a tool for high speed tracking and scanning. With the rising popularity and day-to-day use of smartphones, QR codes have since become a popular marketing tool for attracting customers all around the world. 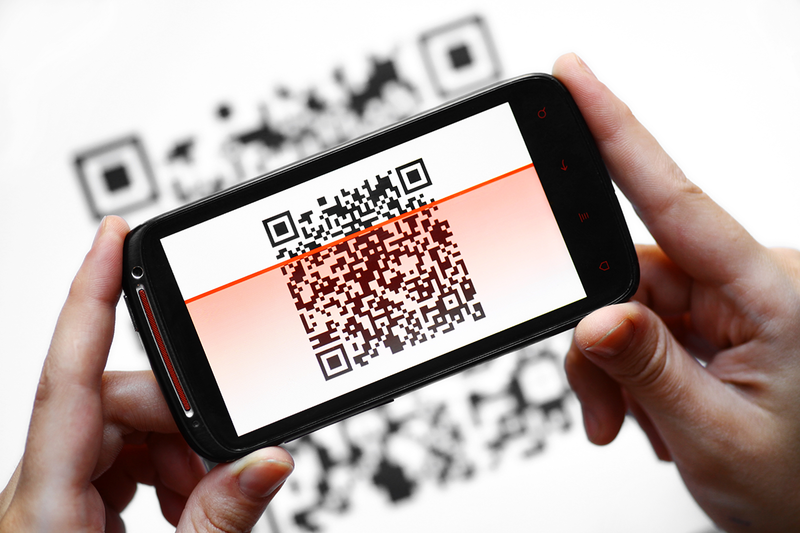 QR codes are a two-dimensional barcode which allows people to use their smartphones to download content. Depending on the type of code, it might direct the person to a website, to make a phone call, to write a text message, and more. They can be thought of like a paper-based hyperlink. Before being able to scan a QR codes, users must have a camera on their mobile device and have downloaded a QR code reading application (available for both iOS and Android). QR codes are a clever integration of print and mobile marketing, creating an exciting new possibility for communication between business and consumers, so why not try integrating them into your business’s marketing strategy? There are so many ways QR codes can be used for marketing. They can be integrated into almost any printed materials such as business cards, brochures, event displays, mailers, posters, product packaging, point-of-sale receipts, and more. Rather than putting all your business details onto a business card, you can simply include minimum details with a QR code that directs people to your website, Facebook, LinkedIn, YouTube, etc. Or try including QR codes in posters. Your business can’t be everywhere, but your QR codes can be, so why not display QR codes on posters at the front of your store and in places your customers might visit (e.g. train stations and bus stops), for them to find out more information about your business while on the go. You can really get creative with your use of QR codes, and how exactly you use them will ultimately come down to what you want to get out of them. If you want to increase your email subscriber list, try using QR codes to direct people to your email sign up list. Or, if you’re looking to increase the social engagement of your business, use the QR codes to send users to your Facebook page. Or, maybe scanning the code will lead them to a page to download a special offer. Using phrases like ‘scan here for a special discount’ can really grab the attention of your audience and encourage them to act. The possibilities are endless, but it’s important to keep in mind that in order for QR codes to be effective they have to be done well. Whatever the purpose of your codes, the landing page they’re sent to should be mobile friendly. After all, your audience will be using their mobile devices to scan the codes. You should also avoid placing QR codes on anything that is constantly moving as it will make it too difficult for people to scan, like clothing and vehicles. It would also be ineffective to place them in hard to reach areas like billboards and online, where it can’t be scanned well. QR codes not only help build your customer base, they have a number of extra benefits for your business. QR codes are environmentally friendly as less text means less printing, so you’ll be saving costs and resources using QR codes. They’re also user-friendly. Sending users directly to your phone number, website, promotions, etc, means less time spent searching for your information – a big tick for customer satisfaction. Lastly, the effectiveness of this marketing strategy is easily measureable using analytics, so you’ll be able to collect information like the number of scans over time and the geographical areas where your codes are most effective. This can help you learn what is and isn’t working for your business, allowing you to invest in the right places to get a return. There are so many ways you can use QR codes to connect with and engage your target audience. From linking customers to special promotions, to providing them with phone numbers and other details, your customers will enjoy the ease and convenience that your brand provides. And for more help with improving the mobile marketing strategy of your business, visit Blue Star DIRECT.